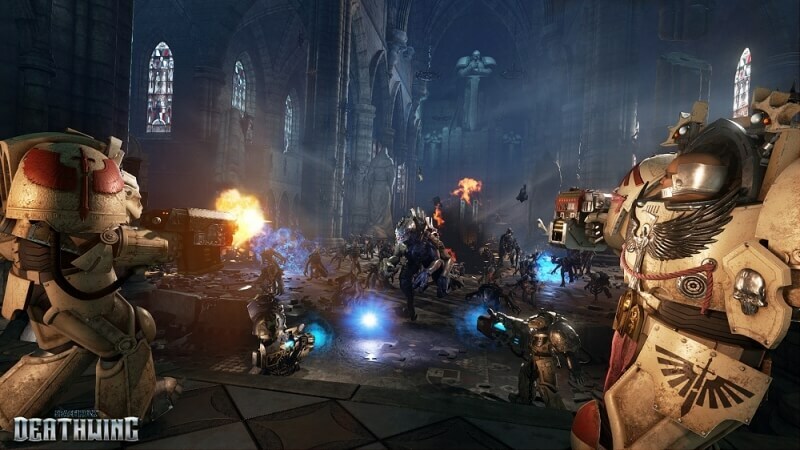 Back in September 2013, French developer Struem On Studio revealed that it was working on a first-person shooter set in the Warhammer 40,000 universe called Space Hulk: Deathwing. But barring a couple of teaser trailers that appeared in the years following the announcement, we’ve not heard much else about the game, until now. A new gameplay trailer shows the kind of action we can expect to see in the final version of the game. Developed on Ureal Engine 4, Space Hulk: Deathwing is described as an “FPS with tactical elements based on the Spacehulk tabletop game,” which, as anyone who has played it will tell you, is brilliant. The game lets you team up with other players to form your squad of Deathwings, the elite 1st Company of the Dark Angels Space Marine Chapter. There’s also the option to let the AI control your teammates. It sounds as if Space Hulk: Deathwing’s gameplay will mirror that of another recent Games Workshop title, Warhammer: End Times – Vermintide. An MS-DOS/Amiga version of the Space Hulk boardgame was released in 1993, which proved to be one of most difficult games ever made. Several remakes have appeared since then, including two from Full Control ApS that arrived a few years ago, but Deathwing is the first to use an FPS view. Games Workshop titles have become quite popular recently. In addition to Vermintide, there’s also Battlefleet Gothic: Armada, and the upcoming Total War: Warhammer. Space Hulk: Deathwing is set for release later this year. Hopefully, it will be able to live up to the Space Hulk name. This could very well be a classic. I hope it will be because it looks fantastic... On a side note I still have a squad of original white metal terminators of the blood angels chapter somewhere in the house.